I have had quite a few unfortunate weather mishaps. Here are just a few that I thought I'd share. One early morning in Biloxi, Mississippi, my grandmother, my friend Tiffany, and I were exploring the grave of the unknown confederate soldier at Jefferson Davis' estate Beauvoir. We could tell the weather was looking bad that morning, but none of us had seen the weather report, so we gave the skies nothing more than a casual glance, and trekked deeper into the wooded graveyard. Pay attention to the weather around you. We were several hundred yards away from the museum building, and had crossed a low water bridge in order to get into the gravesite. It was dark outside, unnaturally dark, but it suited the mood of the graveyard quite perfectly and the chills that swept up my neck seemed perfectly normal in the yellow half light. We heard the sirens first, they blared ferociously, then the rain hit, pelting us with what felt like small needles, then the wind. We looked at each other knowing the sirens were warning a tornado was down in our area. Granny yelled, "Run back," her strong voice sounded feeble in the gale force wind. We turned running hard for our destination, our feet seemed locked on a treadmill, but with enough force we managed to make some head way. I fled ahead of the crowd, trying hard to protect the expensive camera that my uncle had lent me for our outing. I made it half way across the low water crossing, when it hit. My grandmother, and friend, and the other patrons in the yard were behind me, and had stopped in their tracks. The water swelled around me in sheets, as the wind tried its best to take me captive. I ran harder, faster not seeming to make any headway. That's when their arms grabbed me, my body facing the direction from where I'd come, and running away from shelter. Together we pushed hard against the pull of the wind, and together we broke free. I could feel myself being dragged awkwardly towards the museum. Granny and Tiffany let go of my arms long enough for me to turn around and face the museum making our run much easier. Inside the shelter of the museum I began mumbling, "What happened?" That's when Granny and Tiffany began to tell me their story. They had stopped on the path as I crossed the low water crossing because from their vantage point they could see the waterspout swell around me, and in what was only a split second decision they decided to risk everything and run for me. They feared I would be swept away, and they overcame any reservations they may have had, and decided to rescue me from the forces of nature. The force of the water sheets had turned me around, and while I was running, I was running back in the same direction of the graveyard, it had happened so fast, I didn't even know it. 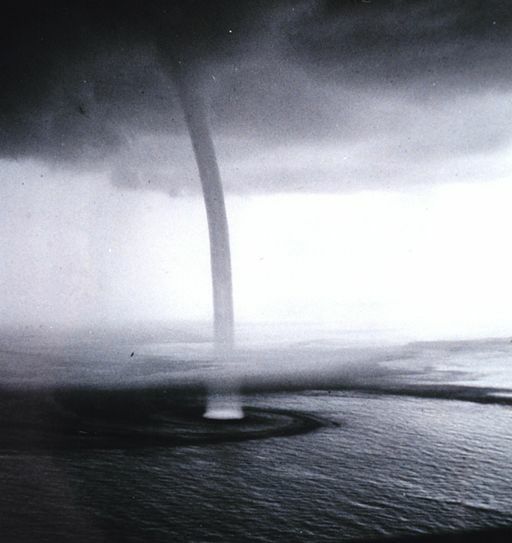 Four confirmed waterspouts touched down that day on the Air Force base alone. But, we survived, although a little shaken. A few years later, I still suffered from the aftershocks of being trapped inside a water spout, anytime the weather resembled tornado weather I would begin to sweat. Until, I was twenty years old, and what had seemed the worst experience of weather in my life got so much worse. 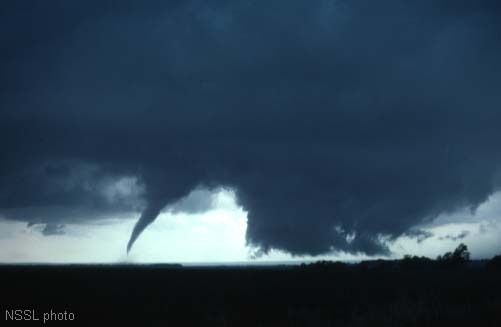 It was South Texas, Runge specifically, and my husband was preaching for the Church of Christ there. We lived in a church house, and it was what I would call a shotgun style house, in fact it was so old, that the wash room had been added by walkway out of the back of the house, and was in a storage shed. The weather could only be described as wicked that afternoon. At the time my son was small almost two, and I decided that I needed to have a brave face for him during the thunderstorm. My husband was in bed asleep, because he had been working the night before at the nursing home, to supplement our income. He slept peacefully with no reservations during the storm. As the thunder boomed and lightning seared across the sky all around our house, I spoke calmly to our son trying to keep him calm. That is when I had the bright idea to go switch the clothes over (outside remember). I told him to stay in the house, because I didn't want him out in the storm. Then I grabbed a basket, and headed toward the back of the house, went through the glass walled utility room, through the back bedroom and into the shed. I switched the clothes over hurriedly, but calmly talked to myself, telling myself that everything was going to be okay and that I could defeat my fear of bad weather. I started the dryer, grabbed the full clothes basket and headed back into the house. I made it inside, and through the back bedroom without incident. But, as I reached the glass walled utility room the lightning hit. Our utility room had a direct power line coming into it from the transformer across the street. Lightning hit the transformer and shot electricity into the room, and since I was the tallest thing there, it went strait into my body. I am sure my scream was blood curdling, the ringing in my ears, and the white light inside my head was excruciating. I staggered into the kitchen, my basket dropped. I stood in the kitchen, blank faced feeling the electricity flowing through my body. My son's eyes were huge and he was staring at me screaming uncontrollably. I could hear my husband jump out of the bed at a dead run from our bedroom heading into the kitchen. My hair which had been dry, was sopping wet, it felt singed and worse I smelled of burnt hair. The electricity still tingled through my body, and I was screaming "Don't touch me!" My husband ran forward to embrace me, and my yelling grew more frantic, I didn't want to electrocute him, and at the time, I believed I would, I could still feel the electricity coursing through my body. My tears were constant and my voice was shaking, but I managed to tell him what happened. We were unsure what to do, so we called someone from the church, and he advised us to go to the hospital. My husband loaded me up in the car, it was still lightning everywhere, and drove me to the emergency room. They doctors ran the EKG on me, they were looking to see if my heart had stopped, because electricity often times does that to a person. My EKG came out fine, but I no longer felt safe at all during lightning storms. It took me about five years to not hide under the bed during lightning storms. It is so important to have accurate, up-to-date weather reports during wicked weather. With a hand crank, you don't have to worry about the batteries dying during an emergency. Then we moved to tornado alley and one night the spring storms came. We were doing okay. I hadn't had a panic attack, although I had already informed my husband and children we were going to sleep in the basement. But, somehow, my husband managed to coax me back into the house and out of the basement. He even helped me calm down enough to go to sleep. But, about 11:30 the thunder boomed waking me up, (the valley magnifies the thunder a thousand times, I swear), and my cell started ringing. My brother was on the other line, telling me that he thought he saw ten areas of rotation around my house. It wasn't the thing you would really want to tell me, but he was worried. The lightning outside our house was horrid, and honestly I hate being on the phone during a lightning storm, because I just know I'll get electrocuted again. Anyway, I had been asleep for awhile, and told him, I had to go to the bathroom. I walked into the bathroom and sat down on the toilet, looking the whole time at the window on the wall. Just knowing that the lightning would finger its way through the glass. Seconds later the lightning hit something on that side of the house. It sounded just like the transformer that blew in Runge, and there was a flash of light. I jumped up from the toilet, screaming and running towards my room all at the same time. Of course, that woke up the kids, specifically my daughter, who upon hearing my screams bolted from bed and started screaming in a blind run towards my room. I grabbed her and told her it was okay, although I don't think my shattered voice, shaking body, and flowing tears convinced her very well. I led her to the closet in the living room and gathered the other kids in there. There was no way on this Earth you were going to get me into the basement in that lightning (the only entrance is through a door outside). From the closet I could see my husband sitting on the couch calmly watching the news. We had severe lightning and strait line winds, but we survived. Although, I am now being teased by my son, who said, "You over react way to much, Mom!" The only real serious thing that happened that night was to my son and husband. They were driving back from Boy Scouts and had to stop under the 340 bridge because the hail and winds had gotten so strong, he couldn't see the road. He was in our big quad cab 1500 Ram truck, and still had to pull over. They pulled as close to the side of the overpass as they could and sat there and waited until the winds, or tornado, had passed. This next morning, my husband called and said that the trees where they took shelter were uprooted, and torn in half. I am so thankful, that they were able to get under the bridge for protection. But, even though they lived through that last night, do they feel nervous at all? Nope. I sure wish I had that courage. It must be nice to be able to sleep through the storms and not feel afraid for yourself and loved ones like that. But, as a perfect end to a terrible night of hardly any sleep, tornadoes that wouldn't quit and lightning to scare me to death, the next morning, it was a little dark outside, but not ominous. I had the TV on in the living room, and suddenly I needed to use the bathroom again. So, I headed off to the restroom, had no more than sat down when the EAS sound came across the TV filling up the whole house. I yelled for my son to go read it, and it was just an alert. But, the only thing I could think of was, "Of course, why not!" Of course my family has decided not to stay to close to me in a storm, because if lightning would strike anyone, it would be me, and concensus says they are probably right. 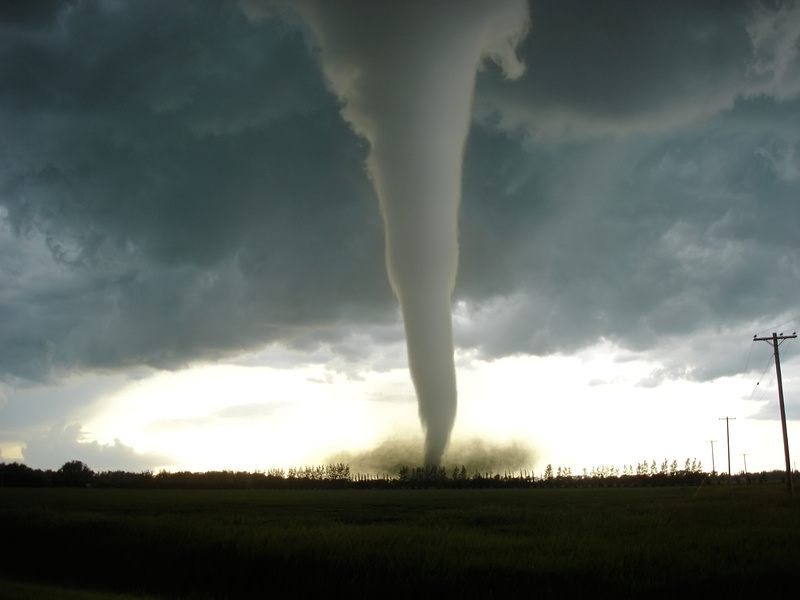 Do you have a true wicked weather story?